Newport hosts countless sailing regattas and championships every year, but the granddaddy of them all is the Volvo Ocean Race. Dubbed “the Everest of professional sailing” by Race Director Phil Lawrence, this celebrated around-the-world team race makes its only North American stop right here in Newport next spring. Held just once every three years, this spectacular event pits some of the greatest sailors in the world against each other on an often-brutal contest that spans from October through June. Volvo crosses four oceans and stops in just 11 cities as they depart from Alicante, Spain, and return nine months later to The Hague, on the seacoast of the western Netherlands. 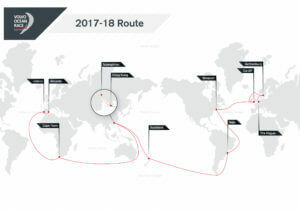 The 2017-18 route is set to be the longest ever, as teams travel roughy 45,000 miles around the world and spend almost three times as much sailing time in the challenging southern ocean as in previous races. After leaving Alicante, teams have a quick jaunt to Lisbon, before embarking on their first long leg to Cape Town, and then traveling 6,500 nautical miles through the treacherous Westerly Storm Track in the Southern Ocean to Melbourne. From Australia, teams again embark on a long leg with multiple route options and climate zones to Hong Kong for a well-deserved rest before another long leg to Auckland, NZ. From here, the boats cross the Pacific Ocean and round Cape Horn on their way to the eastern coast of South America, landing in Itajai, Brazil. The next leg brings the competition home to Newport, before one last long leg across the Atlantic to Cardiff, Wales, and then short legs to Gothenburg, Sweden, and on to the finish in The Hague. If you’ve ever wondered what these world class sailors really feel like after a long burn, you’re in luck! This year’s race will also see more unfiltered social media interaction with the crews. Changes to the race this year allow more creativity and variation in the routes teams take. There is also an effort to include more female crew members, allowing a number of different sized combinations of female or mixed-gender teams, but limiting all-male teams to seven men (one fewer than in the previous race). In the 2014-15 race, Team SCA became the first all-female team to win an offshore leg. No all-female teams have been announced yet for this year’s race, though team Turn the Tide on Plastic features a female skipper. The stopover in Newport runs from May 8-20, 2018, and the public celebration will be back at Fort Adams State Park featuring entertainment, food, children’s activities, team compounds, and a chance to view the race boats up close and in person. You may even get a chance to rub elbows with the world’s top sailors as they launch their massive boats in Narragansett Bay for informal training days. The last time the Volvo Ocean Race came to Newport, in spring of 2015, nearly 130,000 fans swarmed Newport to enjoy race festivities. More than half of those fans came to the Ocean State from other U.S. states and internationally, according to Volvo Ocean Race. “The economic impact of the 2015 stopover on Rhode Island is estimated over $47 million,” according to a study commissioned by Sail Newport and reported here. All teams will participate in an in-port race on May 19, with the transatlantic leg of the race launching May 20. It will be a great time for sailing fans to plan a trip to Newport to be part of the action. While you’re in town, check out some of our favorite hidden gems in Newport and stop by for a sail with us! 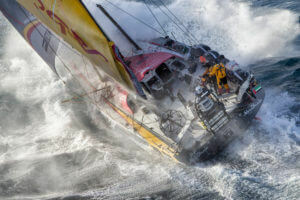 Lead photo credit Ainhoa Sanchez/Volvo Ocean Race.